In September 2017, the Noble Network Mansueto High School opened its doors in the Southwest Side Chicago neighborhood of Brighton Park. The school is the area’s first Noble charter school and is the anchor for a new development adjacent to the campus that will house community non-profits as well as the Esperanza Health Center. Burnham is proud of have assisted with permitting for Mansueto High School, as well as be a part of the Esperanza Health project team. 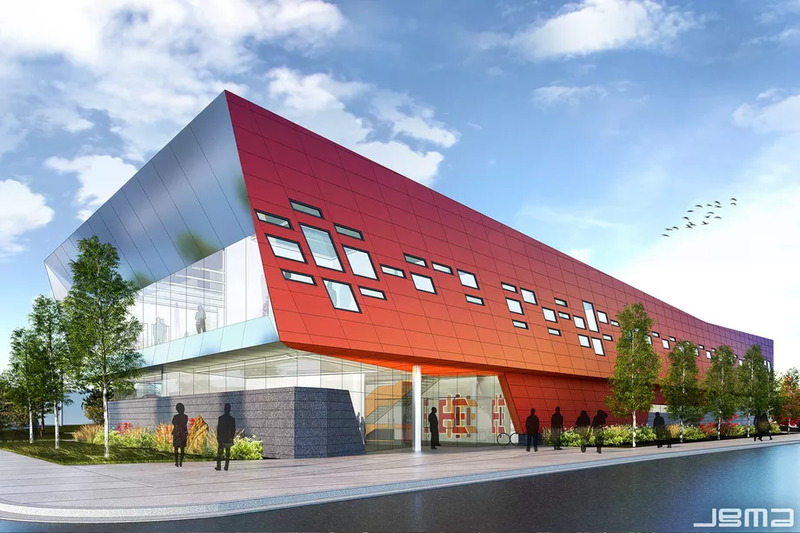 Designed by Juan Gabriel Moreno Architects (JGMA), the building will house Esperanza Health, a community pharmacy, and spaces for Mujeres Latinas en Accion and other non-profits, and community and wellness areas. JGMA is “committed to active community involvement” and has designed buildings throughout the City of Chicago, specifically in neighborhoods without access to education, social programs, and public space. We want to share a look at the Brighton Park developments as well as some other JGMA projects repurposing existing spaces and bringing access to communities throughout the Chicago area. Located at 4700 S. California Avenue, the three-acre site of the Esperanza Health Center buildings and nearby Mansueto High School is a former industrial site, and the new building will replace an existing vacant slab. The entire site was previously occupied by the Royal Crown Bottling Company plant demolished in 2013. The new center is comprised of the building and outdoor spaces, including walking trails and community gardens, and the design aims to link the outside plaza and open lobby entrance to into one cohesive, flowing space. The building features glass walls to bring in daylight throughout the structure, avoiding the typically closed, windowless spaces of health clinics. New community resources include community rooms for youth programming, access to domestic violence prevention services, and a new playground on-site, as well as a meditation garden for area students and a community kitchen. The building’s design specifically references movement throughout, including flowing “bubbles” on the exterior, and concentrates services offered as a holistic approach to healthcare, including opportunities for physical activity. Projects of this scope require approvals from multiple city departments including the Department of Planning and Zoning, the Chicago City Council, and the Bureau of Fire Prevention. Burnham Nationwide is permitting the project via the City of Chicago’s Standard Plan Review Permit Program, the core review track at the Department of Buildings (DOB). We are utilizing phased permitting throughout the life of the project, allowing the project team to pull foundation permits separate from the full buildout. A nearby site is also seeing development with another JGMA design, the Gads Hill Center’s new home in a former storefront location. Gads Hill Center, an early childhood education non-profit, will offer youth education services in the repurposed space. The building at 4255 S. Archer Avenue will be undergoing adaptive reuse, including the renovation to the exterior of the structure. JGMA’s design will remove a previous addition to the facade with incongruous “building materials, ornamentation, and roof lines” and will “reshape and unify the building's exterior while also adding some new architectural elements,” according to Curbed Chicago. The lot will also be reimagined to include a playground and recreation spaces.The renovation required approvals from the City of Chicago’s Department of Planning and Development for preservation of existing features and will incorporate the accurate, existing features into the center’s new child-focused design. JGMA’s projects, specializing in education and other community-focused developments, have repurposed other unusual sites. In suburban Waukegan, the Cristo Rey St. Martin College Prep campus replaces a vacant Kmart store. The 120,000 square foot big-box store is four times the size of the high school’s previous location and required a thorough transformation of the store space. In the new space, Cristo Rey St. Martin has 18 new classrooms and laboratories along with a cafeteria and new library commons. Key to the redesign are new skylights, which bring daylight into the previously windowless structure, as do new windows in the front facade as well as those overlooking adjacent wetlands. Empty retail space plagues many communities, and the conversion of a large-scale empty building into a needed school can provide a model for similar creative repurposings in surrounding areas by providing cost-effective yet impactful renovations. The project will continue to adapt to the needs of the students and the community through a open-ended, modular design. The renovations target blighted or vacant buildings provide a tangible sign of reinvestment in areas without easy access to educational choice, healthcare, or needed community services. The development at the 47th and Archer site is not yet complete, and we look forward to seeing the additional growth planned at the site and throughout the nearby Southwest Side communities.